Distinctive features: One of a series of models manufactured in communist Bulgaria and exported to the west. Available in several bright colours. Main integrated circuit - Rockwell A1030ME. 70 mm x 135 mm x 30 mm (2.75" x 5.3" x 1.25"). This and other models were sold in Western Europe. 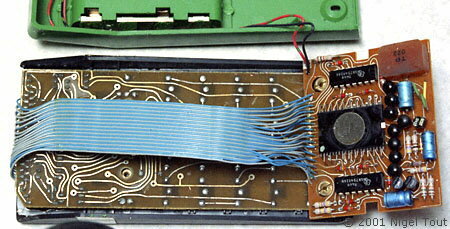 Inside the Elka 101, with the Rockwell integrated circuit in the middle of the board on the right. The name Elka is derived from the Bulgarian for Electronic Calculator. The first Elka electronic calculator was introduced in 1965, while the ELKA-22 of 1966 had about 260 Transistors, 760 diodes and an 180-bit ferrite memory. 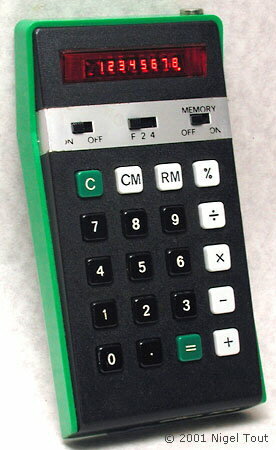 The first calculator using Bulgarian-made SSI and MSI ICs (under the "UNIMOS" trademark) was the ELKA-42. This was developed by the "Institute of Microelectronics", which later became part of "Microelectronics"-Botevgrad, and was exhibited at the Osaka World Expo in 1972. (Information courtesy of Todor Arnaudov). This was the middle of the period of the "Cold War" and Eastern European communist countries lagged behind in the development of integrated circuits and displays. 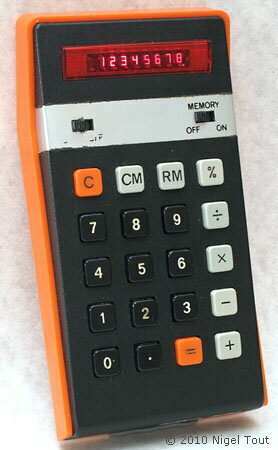 The introduction of hand-held calculators in Japan and the West caused consternation there and was met initially by importing the technology, as here by using Rockwell and Texas Instruments integrated circuits. Bulgaria had one of the largest electronics manufacturing industries of the Eastern European countries and in the late 1970s was in the top 10 of world consumer electronics manufacturing countries. and Sergei Frolov's Soviet calculator site at http://www.leningrad.su/museum/.